GoDaddy doesn’t need an introduction really. They are the world’s largest domain registrar. Till this day, people have registered about 77 million domain names under GoDaddy. Currently, they are serving about 18 million customers all over the world. Besides registering domain names they also provide customers with hosting accounts. They offer a wide range of web hosting solutions from shared hosting to advanced dedicated hosting. Among all the hosting solutions, the shared hosting of GoDaddy has got the most popularity. As a result, we will be talking about the shared hosting packages of GoDaddy in today’s post. In this article, we will provide you with a lot of insider information and our unbiased opinion about the shared hosting service of GoDaddy. If you are in a dilemma whether you should choose the shared hosting service of GoDaddy or not, we believe after reading this you will be able to take your final decision. So, if you are ready, let’s get started. What is Shared Hosting Service? Shared hosting is the most used web hosting solution in the world. So, you might already know all about this. However, if you are not familiar with a shared hosting service, we are going to explain the concept to you next. As the name suggests, when you get a shared hosting account, you are getting a server to host your website/s which is shared with several other users. The web server normally consists of resources like CPU, RAM, OS, and Storage Space etc. In the case of shared hosting, all of the resources of a server is distributed among multiple users. That way, the cost of maintaining the server also can be distributed amongst all the users. And, as a result of that, the cost of owning a shared hosting account is the lowest. So, you can see that shared hosting has its good and bad sides. The good thing is that you can host your websites by spending a small amount of money. But, on the other hand, you are limited by the resources of the server. And, if a server has more users, it will perform worse. So, if you are owning a lot of high-traffic websites, you should not opt for a shared hosting account. GoDaddy has 2 types of shared hosting plans. You can choose between Windows and Linux OS based shared hosting packages. We will discuss both of these types of packages here. First, we will be covering the Linux OS based plans. So here we go. For your information, there are 4 different packages of Linux OS based packages. They are Economy, Deluxe, Ultimate, and Business respectively. Next, we will be exploring all these 4 packages. If you are planning to start only one website then this is the package you are looking for. The ‘Economy’ package comes with all the basic features of a web hosting plan. And it will cost you only 7.99$ per month. You can only host one website with this ‘Economy’ package. And, you are getting only 100GB storage. However, it will be enough for a single website. You will also get unmetered Bandwidth. Now, if you want more features or want to host multiple websites then you have to look below. Now, we are talking about the most popular shared hosting plan of GoDaddy. This plan has everything you want on a shared hosting plan. But having all the awesome features, it is priced very reasonably. You will be able to get this plan with spending only 10.99$ each month. This package comes with unlimited Storage, Unmetered Bandwidth, and you can also host unlimited websites with this plan. So, if you are searching for a shared hosting plan which is affordable then this will be the perfect one for you. Now, we are going on to the higher priced plans. This package might be a bit pricey. But we have to admit that this plan comes with a lot of extra features which are not available on the previous two packages. The ‘Ultimate’ shared plan will cost you only 16.99$ per month. You can create unlimited websites using this plan. Also, you will have the unmetered bandwidth and unlimited storage. Along with all these, you will be getting free SSL certificate for your domains. And, there will be free Premium DNS with the ‘Ultimate’ plan. That is not all. This plan will come with 2x processing power & 1 GB RAM. If you have multiple highly visited websites then you can use this powerful shared hosting plan. As the name suggests this plan is intended towards the high-traffic and resource-heavy business sites. It is another high priced plan. You can take this plan by paying 29.99$ per month. And, you will receive unlimited storage, unmetered bandwidth, and will be allowed to host more than one websites at once. This plan comes with free SSL Certificates and dedicated resources. So, for power users, this can be the best shared hosting plan out there. Now, let’s talk about Windows OS based plans. There are only 3 windows OS based plans of GoDaddy. They are Economy, Deluxe, and Ultimate respectively. Let’s see what they bring to the table. This plan starts at 7.99 $ per month. You can get this package if you are going to host only one website. Because you cannot host more than one websites using this package. You will have 100GB storage and Unmetered Bandwidth. Also, if you get this package for one year then you will be able to register a domain name for free for the first year. Along with all these, you will also get all the basic features with this package. GoDaddy says that this is the ‘Best Value’ package from them. You have to pay only 10.99$ each month to get this package. You can host unlimited websites using this package. You will also have unmetered Bandwidth and Unlimited Storage. You will also get one free domain for 1 year. This is the priciest windows based shared hosting package from GoDaddy. However, it comes with the most features. The ‘Ultimate’ package will cost you 16.99$ per month. In return, you will get unmetered Bandwidth, premium DNS, free SSL certificate etc. You can also host multiple websites with the ‘Ultimate’ package. This package will be a good choice if you have multiple heavily visited websites. With all these packages, you will get more features and services. We will be talking about them later in this post. For your information, the mentioned prices of the packages here are not final. As GoDaddy runs promotional sales from time to time, the mentioned prices are changeable. So, if you want to get the best price then you should wait for a sale from GoDaddy. Who should use the GoDaddy Shared Hosting Plans? There are a number of shared hosting packages from GoDaddy. So, most of the website owners will find a suitable plan according to their requirements with ease. Shared hosting plans can be perfect for a user who is just starting their online journey. If you are a beginner then this type of plan will be very good for you. GoDaddy offers all the necessary software and tools with your account for free. And, all the tools and software are very easy to use. These were developed specially for beginner users. So, you can get started with any of the GoDaddy shared hosting plans. If you are searching for reasonable web hosting packages then you can take a look at the price range of their packages. GoDaddy has made all their packages very affordable. So, we bet you will find one which is within your budget. All of the shared hosting packages are perfect for small websites. However, if your websites receive a huge amount of traffic monthly, then you should refrain from using any shared hosting plans. Because even though you will get unlimited storage, the servers are shared amongst multiple users. So, your website will be down if you receive a lot of traffics at once. In this case, you can use any other web hosting solutions like dedicated, VPS, or cloud hosting. 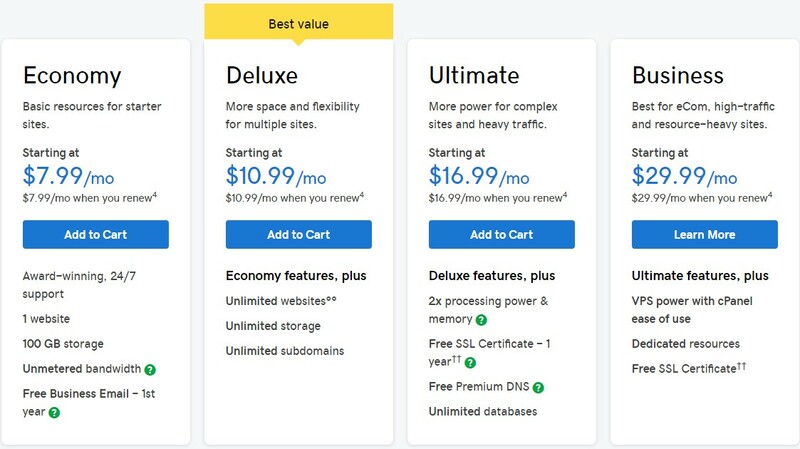 So, if you own multiple small websites or your personal blog and at the same time you have a tight budget then GoDaddy shared hosting plans will be the best choice. Great for hosting what web applications? If you are not new to web hosting then you should already know that there are a lot of web applications out there. You might know some of them as CMS (Content Management System). Not every web hosting company optimize their servers to support different kinds of web applications. So, you should check if your next web hosting service is optimized for most of the popular web applications. But fortunately, GoDaddy supports almost all of the popular web applications. Not only that but also they have very unique features and software for the popular CMSs. For instance, you can install any CMS with their 1-click app. This is a very helpful feature. As anyone can install their favorite CMS within just a minute without having any professional skills. And, if you choose any Linux based plans, then you can install over 125 web applications with just a few clicks. And, conversely, you can install over 50 web applications with just a few clicks using any of the Windows hosting plans. GoDaddy is fully optimized for all the most used CMS like WordPress, Joomla, Drupal, Magento, PrestaShop etc. The windows based plans come with ‘Windows Server 2012 R2’. This powerful operating system will help you to customize the server your way. With each shared hosting plans, you will get the free auto-updater software pre-installed. This tool will come in handy. As it can automatically update your currently used CMS to the latest version every time a new update is released. With all these features, you don’t have to be worried about using any web applications with GoDaddy shared hosting plans. We can assure you, you will be able to use any CMS on your website to create contents. 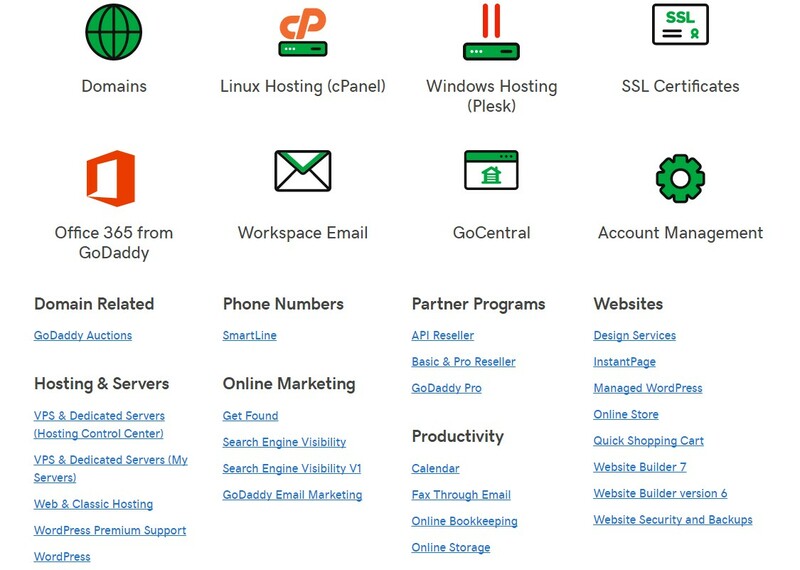 GoDaddy provides a myriad of services with each of their shared hosting packages. We will talk about a number of them down below. 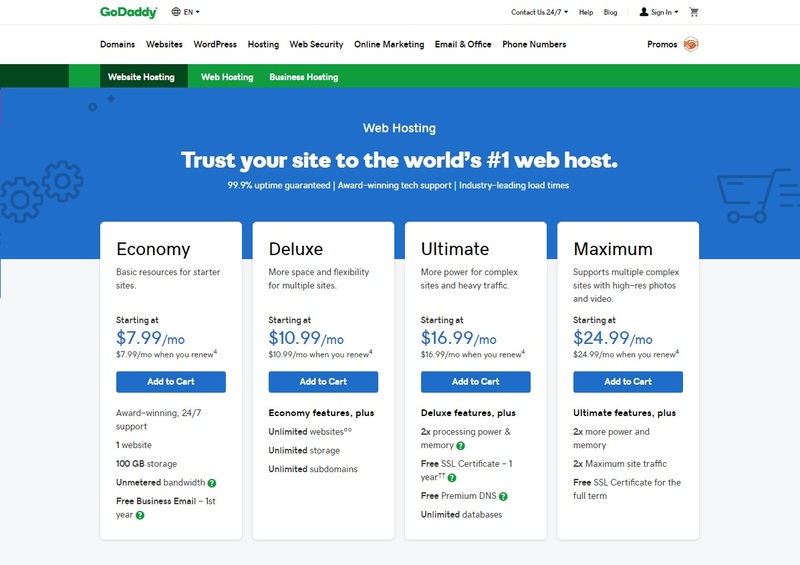 GoDaddy offers an awesome service by providing all of their shared hosting package users with the opportunity to get a free domain name for 1 year. To get this service, you have to buy any shared hosting packages from GoDaddy for at least 1 year. When you register a new domain name with GoDaddy, you will be able to set it up it within a few minutes. They offer 1-click setup for all the domains registered under them. All of the websites hosted on GoDaddy servers are monitored constantly. They have set up security software to prevent any type of DDoS attack. So, your website hosted on GoDaddy will be protected. As you already know there are some limitations using a shared hosting account. So, if you are using shared hosting, there might come a time when you would have to upgrade your account. Fortunately, you can upgrade or add additional resources (CPU, RAM, Storage etc.) with just a click from within your account dashboard. You will get the ‘Odin Plesk’ control panel with all your windows OS based packages. And, conversely, you will get ‘cPanel’ with the Linux OS based plans. Both of these control panels are highly used because of their user-friendliness. Anyone can manage their web hosting accounts using these intuitive control panels. Let’s talk about some of the most popular features of GoDaddy shared hosting package. Your websites will be protected from any type of virus attack. And, their pre-installed spam prevention system will keep you safe from any type of spams on your mailbox. With the help of the SSH Access technology, you will be able to access your website’s servers from anywhere in the world remotely and securely. And with the help of ‘Cron Job’ tool, you can schedule any type of repeated tasks from within your cPanel. That way, those recurrent tasks will be carried away automatically. Except for the ‘Economy’ package, you will be able to host unlimited websites using any other shared plans of GoDaddy. You will also have unlimited storage and unmetered bandwidth. You can add additional subdomains, FTP accounts, email accounts (custom ones) to your shared hosting account without any extra cost. If you want you can add more features to your account at any moment. For instance, if you want to take backup of your site, you can add the ‘Site Backup & Restore’ feature by paying only 2.99$ per month. This tool will take automatic backup of your site once daily. So, you can restore your sites’ data anytime you want to. Before you finalize the choice of your next web hosting provider, you should know about their performance. First of all, you should know that if the web hosting company has faster web servers or not. Without having a faster web server, your websites hosted on their servers will be so slow. And, we don’t have to tell you that you should have a faster website to be on top of the competition. GoDaddy claims that they have the industry-leading performance when it comes to website speed. So, we will now test if this is a true or false claim. To do that we will use the famous website named Pingdom. And, we will also use a website which is hosted on the servers of GoDaddy. So, using the test servers of Pingdom we will be able to measure the load speed of that particular site. Eventually, we will get to know the real performance of GoDaddy. For this test, we will be using the Washington D.C. server of Pingdom. Let’s start. After the test was conducted, we have got that the ‘Performance grade’ of the test website which is ‘Grade C’. This data is not related to the website servers or the web hosting company. Rather, the ‘Performance Grade’ depends on the website owner. The owner of the test site could easily improve the Performance grade with just a few tweaks from their side. But, for us, the important stat from the result is the ‘Load Time’. First, let me tell you that a website must load within 2 seconds to be considered as a fast website. Otherwise, the visitors will feel the crawling speed and they will leave your site. So, it is better if your website loads faster than that. Amazingly, we see that the test website took only 362 ms to load. This is astonishing. We told you that a load time of 2 seconds is enough. Whereas you can see that this website was loaded in just 362 ms. Incredible! All credits should go to the highly optimized servers of GoDaddy. So, if you were in dilemma whether your website will perform good or bad with GoDaddy, then you can be assured that you are in good hands. Another important thing about web hosting companies is their uptime. The easiest way to find about the uptime stat of any web hosting company is their website. Yes, you can go to their own website and find about their uptime record. It might be the easiest way to find out the data but it is not the best way to do that. Why? First of all, the web hosting companies don’t tell the truth on their website. They claim that they have 99.99% website uptime record. But, in truth, it is the opposite for a lot of web hosting companies. So, you should not believe that. Now, there’s another way to get to know the original uptime of any web hosting companies. You can use their web hosting service and then find out the real deal. However, this is not possible for all of us. Thus, we have taken this into our own hands. We have hosted a website on GoDaddy. And, we have been keeping our eyes on the uptime of that website for a long time. So that we can know the real uptime stat of GoDaddy. As a result, we will be sharing the uptime stat of GoDaddy with you. Here is the uptime stat of GoDaddy for the last few months. Is it good enough? Here’s the thing, if a web hosting company can’t maintain a 99%+ uptime constantly then you should avoid that particular web hosting provider. But, we can see that GoDaddy has been doing well for the previous 10 months. They have kept the uptime record of our test website up to 99%+ continuously. 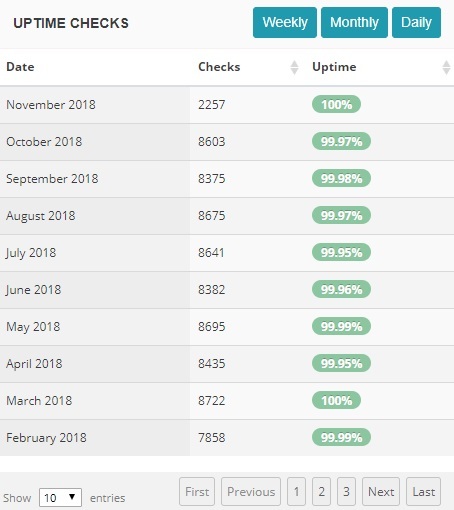 Not just that but also GoDaddy has maintained 100% uptime on most of the months. To be honest, this is truly a great performance. And, we can guarantee that you will also love GoDaddy for their industry-standard uptime record. We are very happy with their performance. This post will not be completed without a review of the customer service of GoDaddy. Because a company can offer you the lowest price or the best features but if they don’t have the best customer support you will have a hard time to deal with them. And, when it comes to web hosting related issues, a good and helpful customer service can go a long way. Fortunately, GoDaddy is very strict about their customer service. They have one of the best customer service departments on the web hosting industry. GoDaddy has created a great reputation about their customer service worldwide. They have some of the best highly skilled customer representatives. But, the most important thing about them is that they are helpful. We have had to contact them a number of times. And, we were never disappointed. We have talked with them about some technical stuff and they helped us. They offered the easiest solution if the problem was solvable from our side. If the issue was on their side, they have solved it pretty fast. We cannot recommend them enough. We have talked with them using the ‘Live Chat’ option. However, there are other ways to get in touch with them. Here are some of them. However, not all of these methods can be used by everybody. You have to be one of their customers to take advantage of all of these ways. The best way to contact them is to use the ‘Direct Call’ option. They offer country based customer support via direct call. And, they are available 24/7/365. So, it doesn’t matter from which country you are. You can always find them. Again, if you want to solve your problems without contacting them, you can do that easily. Because GoDaddy has a lot of tutorials and help-articles on their support page. You can learn from those articles. And, these articles are organized by their categories. So, it won’t be a problem to find the solution to any particular problem. Most of the time, you don’t even have to contact their support team at all. You might find the solution from those knowledge-based articles. Our Final Words: Do we recommend GoDaddy Shared Hosting Service? We recommend GoDaddy shared hosting service for websites that need low server resources. First and foremost, you can choose between Linux and Windows OS based hosting package. There aren’t many other web hosting providers who offer this on their shared hosting packages. Along with that, the price of the packages is very reasonable. You don’t have to pay a hefty amount of money if you are going to use any one of their packages. All of the packages come with some awesome features. Even then, if you’re not satisfied with the features you have the ability to use add-on features as well. We have talked about several services and features of GoDaddy shared hosting service on this post. But, there are a lot of features still unmentioned. So, you can be sure that you will not be disappointed using their service. Additionally, we have revealed the original uptime record of GoDaddy with you. You have found out that they are capable of maintaining the industry-standard uptime record effortlessly. We have also tested the speed of GoDaddy. We have shown you that a particular website hosted on GoDaddy was loaded less than half a second. 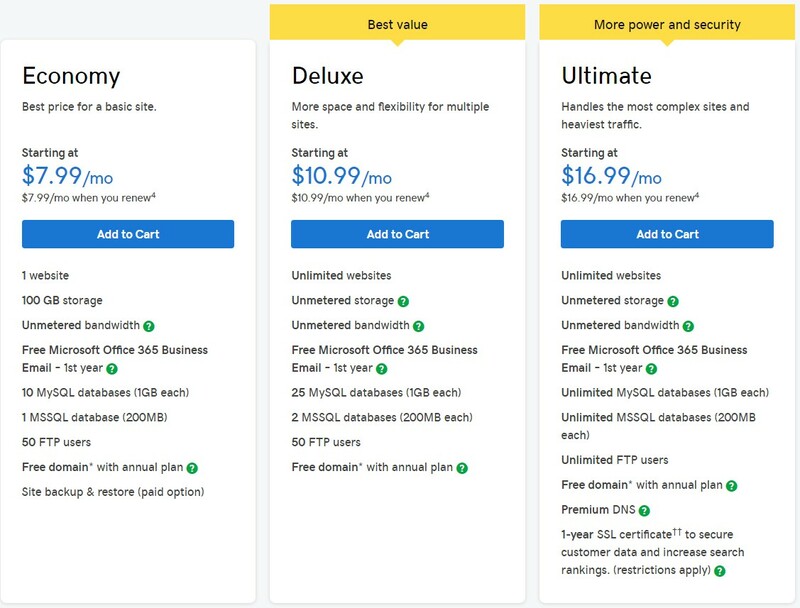 Above all of these, GoDaddy also offers free domain registration if you get any one of their packages for at least 1 year period. So, it is simple to see that if you want helpful customer support, fast websites, industry-leading uptime, you can go with GoDaddy shared hosting service without a doubt. We recommend GoDaddy shared hosting service for websites that need low server resources. First and foremost, you can choose between Linux and Windows OS based hosting package. There aren’t many other web hosting providers who offer this on their shared hosting packages. Along with that, the price of the packages is very reasonable.